Warm temperatures and rain are melting the ice and snow away. Although I’m sure we will be back to winter weather soon, I’m enjoying the thaw, watching the dirty mounds of snow melt, leaving behind road salt and patches of mushy, brown earth. Since December 1, I’ve had a streak of publications, including works in Caesura, Spillway, Escape Into Life, Strange Horizons, The Country Dog Review, and most recently, Cold Mountain Review. I will have to be satisfied with these for a while, because I haven’t been sending out a lot of work, and more importantly I have not written a new poem in 2013. I have, however, been reading a lot! And I’m really looking forward to the new poetry books and short story collections that will be out in the new few months. I’ve also been working on a batch of short stories. I have discovered that my writing process for attacking the short story is actually much like the way I work with poems. I write a draft, go back, edit paragraphs and sometimes pages, rearrange, and then take a break, letting the work breathe for a few days before I read through the draft again. Right now, I have four short stories in progress. I would love to have at least one “finished” enough to send out in the next month or so. Still, I’m not forgetting poetry! Based on Diane’s recommendation, I recently purchased Wingbeats: Exercises & Practices in Poetry edited by Scott Wiggerman and David Meischen (It’s less than $10 on Kindle!). I have already started reading some of the prompts and tips, and am sure they will help kickstart some new work soon! The elegy is a poem of mourning. When I teach the elegy, I tell my students that this poem can mourn any kind of loss: a person, a time, an event, or something more abstract, like happiness or innocence. 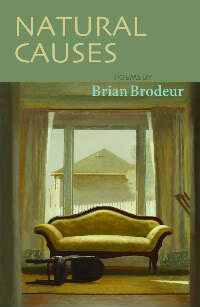 In Brian Brodeur’s most recent collection, Natural Causes, he explores loss in its many shapes and forms, focusing on the fragility of what we hold most dear (forgive the cliché). This opening poem readily prepares the reader for the work that follows. Most poems are narratives focusing on loss in one aspect or another. These narratives are told through different personas and thus take on different voices. Sometimes, we read about narrators who are watching the world. For instance, in “The Boy Without Arms” the narrator observes a boy maneuvering society with “his sleeves cut off, his hands dangling/directly from his shoulders, stiff unfinished.” In another poem, “On Suffering” a narrator hears a story on NPR about a Tutsi woman who is attacked and raped, and after being stabbed in the abdomen, gives birth to a baby who dies when attacked by wild dogs. For those who want to read more of Natural Causes, take a look at its page located at Autumn House Press. And if you have never checked out Brodeur’s blog, How a Poem Happens, you should visit his site here. Here in Western Pennsylvania/New York, we are bundling up to get through the coldest weather we have had this winter. In the last few days, I have been waking up to single digits with blowing wind and snow. I’m cold and grumpy. My colleagues are cold and grumpy. My students are cold and grumpy. I’m lucky that I just got a new battery in my car; otherwise, my car would be cold and grumpy too! As soon as I warm up, I will be back to my regularly scheduled blogging! My first speculative poem has been published! In this week’s edition of Strange Horizons, you can read “Watching for Aliens Over the Allegheny” which combines my interest in ufology with my love of the Alleghenies (where I live) in Pennsylvania. The newest issue of The Country Dog Review is now live! I’m thrilled that two of my poems have been published along with great work by Justin Hamm, Leah Mooney, Molly Spencer and Tasha Cotter. Check out all the work here. Witness has just announced their annual theme for their Spring 2014 issue. From now until March 31, editors are inviting submissions of fiction, nonfiction, and poetry for the theme of ghosts. Sounds a bit spooky! Click here, where you will be directed towards the Submittable page, for more guidelines. River Styx is looking for American odes. However, the editors, according to the website, do not want “rah rah patriotic paeans to America.” Read what the journal is looking for here in the guidelines. Submission deadline is January 31, 2013.